View high-definition content on your TV without a PC? Although HDTV has yet to really take off in the UK, the sale of HD-compatible TV sets is certainly increasing. While the World Cup was undoubtedly a large reason for this, more people are becoming aware of the huge increase in picture quality that HD provides. Computer users have had access to HD content for a while: a standard computer monitor running at a resolution of 1,024 x 768 surpasses the 720 lines required for HD pictures. Few people want to watch TV on a pokey little computer monitor, so a means of displaying the content on a TV is needed. There are two options: a Media Center PC or a media server. The trouble with Media Center PCs is that they're bulky, noisy and vastly overpowered for watching TV on, and few, if any, actually offer HD output. Step forward the media-server: a self-contained, relatively small box with proper video outputs that's capable of handling pretty much any media format you throw at it. PixelMagic is a company that specialises in high-end audio visual equipment, and its HD MediaBox MB100 reflects this heritage. This is the first media server we've seen to date with an HDMI port, enabling full digital transfer rather than component, which is analogue. Although the MediaBox has the ability to be fitted with an internal hard drive, by default it's supplied without one and so operates as a media streamer rather than a server. 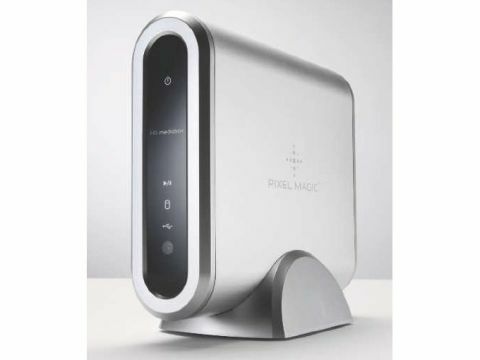 When connected to your network it can access other compatible NAS devices and stream the content across to your TV. It also has two USB2 host ports, which means that you can connect external drives to it and play any content on those devices, too. However, presumably as a form of copy protection, you can't transfer files to the MediaBox from external drives or via the network. Instead, you need to plug the MediaBox into your PC and transfer them that way. Even if you don't have an HDcompatible television, the MediaBox still offers conventional analogue inputs in the form of RGB, S-Video and composite outputs. HD is taken care of by HDMI and component connections, while audio can be output by stereo RCA, digital coaxial or digital optical. However, changing the output signal and resolution did cause a few problems. Whenever you select an option in the menu, the MediaBox appears to momentarily cut the output signal. When connected to our Toshiba LCD TV, this had the undesirable side-effect of the TV switching to Freeview. This proved to be a complete nightmare, because every time we selected an item, we had to reach for the TV remote and switch it back to the HDMI input. Whether this is the fault of the Toshiba TV to the Media Box is debatable, but it's worth being aware of. In HD mode, picture quality is exceptional and even DVDs ripped to VOBs and played back in standard definition looked superb, with vibrant colours and no noticeable artifacts. However, compared to the MediaBox itself, we think that the remote looks a little cheap and the button placement is a little unconventional. Having said that, if you're looking for a way to play back your media on a TV, without investing in another PC, the HD MediaBox should be right up your street.